Sleepy but excited voters got on a bus at dawn in Charleston to ride six hours over the Allegheny Mountains to Washington, DC so they could ask their senators to save health care for West Virginians before it’s too late. This group of grassroots activists made the trip to pay visits to their two senators, Democrat Joe Manchin and Republican Shelly Capito. For Manchin, they brought their gratitude for his promise to vote against a bill that will take health care away from hundreds of thousands of West Virginians. 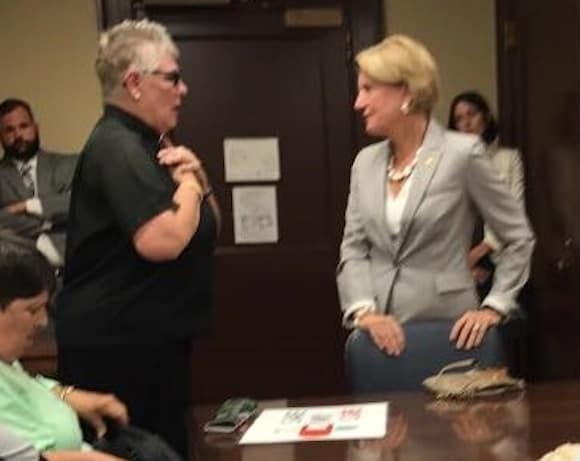 For Senator Capito, the riders brought stories of healthcare heartbreak and fears for what may happen to their friends and family should the Senate bill pass. The state of West Virginia is a pivotal battleground in the fight for healthcare. West Virginia was one of the biggest beneficiaries of the Affordable Care Act when it was fully implemented; an estimated 180,500 residents currently benefit from the Medicaid expansion, and WV’s uninsured population has been more than cut in half since the ACA passed. In January of 2014, the first month of full implementation, Charleston’s CAMC hospitals – the largest hospital system in the state – reported a 75 percent decrease in non-paying patients. The GOP’s effort to cut these health benefits – which are working for hundreds of thousands of West Virginans – puts the state’s junior senator, Shelley Moore Capito, in a unique position as a moderate swing vote in the Republican caucus. This combination of a uniquely grave threat to the health of West Virginians and the opportunity to appeal to Senator Capito’s conscience, and influence the course of the national health debate, has fueled unprecedented engagement among voters. “I think our presence was felt in the halls of the Senate office buildings,” says Sally Roberts Wilson, a longtime activist from Morgantown and former Director of Research and Planning for the WV Hospital Association. After some confusion over scheduling with Senator Capito’s staff, Senator Capito made time to meet with the group for about 25 minutes. Most simply told their story, or implored the Senator to at least let the public respond to the bill before casting her vote. Reverend Janice Hill spoke first in the meeting. Approaching Senator Capito, she asked the Senator to look at pictures of her daughter. She first showed Sen. Capito a picture of her daughter when she was healthy, then a second from her time being treated for cancer. I want you to see a picture that goes along with this, a face. That’s my daughter. She’s 41 years old and has been fighting this cancer for four years… She would not be alive today if it wasn’t for the ACA. With the cap if she ever lost her insurance… in 7 months she went over $1.2 million.